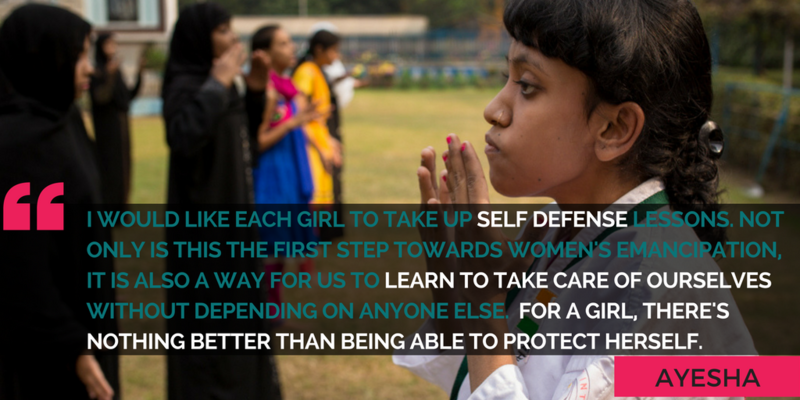 During 16 Days, Ayesha of Girl Connected urges girls to learn self defense! The 16 Days of Activism is all about taking action to challenge gender-based violence and discrimination. In a moment when women and girls’ fundamental rights are at risk around the world, Ayesha from Girl Connected reminds us of the urgency of fighting violence and misogyny every day. From being forced to leave school at age 5, to feeling the impact of restrictive social norms and gender-based violence – Ayesha is no stranger to the intertwined barriers to girls’ education and empowerment. Women and Girls Lead believes that connecting girls to each other’s powerful stories of leadership and resistance can give them the confidence to stand up for themselves and their peers. At a time when mainstream media often sends the message that girls deserve less, we need to bring the focus back to girls’ own voices. Koen Suidgeest’s Girl Connected does just that. Girl Connected follows the story of five teenage girls from India, Kenya, Jordan, Bangladesh and Peru who are challenging some of the harshest obstacles standing in the way of girls’ progress today. The film and our five “Girls Connected” prove that against great odds, young women everywhere are taking action and standing up to oppression. Ayesha wants girls to learn self defense to fight GBV. In the rest of the blogs from this 16 Days of Activism series, we’ll bring you calls to action from each of the five girls! We hope you’re ready to create a more gender equitable world. Follow us and be the first to catch the online release of Girl Connected in March 2017. Share your own #GirlConnected story on Facebook and Twitter! Next Post 16 Days of Activism: Let Your Voice Be Heard!